The money is in the list. Well, that’s what I’ve heard and almost every guru and guru-in-training will tell you that for long term success online you need to build a healthy, responsive email list. What is harder to find is the best way to do it. I’m sure that there are many techniques and having a free offer is definitely important. But you still need to get eyeballs to your offer to get them on your list. So, the big question is how do you do it? I’ve tried Twitter but even with over 2,000 followers between my 2 accounts I rarely get any traffic there. I’ve gotten a few from my website and even used Google AdWords free $100 credit to drive a few in (that was before I had the free offer so the conversion rate was abysmal). I don’t have a budget for solo ads and I don’t have enough subscribers for an ad swap — yet. But one technique that seems to be working fairly well is giveaway events. If you don’t know what these are then you owe it to yourself to find out. So far, I’ve only found 1 that is in my niche (personal development), but the offer that I have works fairly well in the online marketing niche which most events fall into. The idea is simple. You sign up before the event goes live as a contributor (aka JV or JV partner). You can set up a product offer to describe your gift with picture and text. You link this to you squeeze page. You can usually upgrade to get more offerings by either referring other contributors (and gaining points) and/or paying an upgrade fee. Once the event goes live, general members and contributors can scan through all the gifts and download anything that strikes their fancy. Your gift will be in there and if you’ve got some compelling copy and a good product image to catch their attention you’ll find a surge in signups. The real magic is in the promotion of the event. The event will typically be open to the public for 1 week although some are longer. Each contributor will be promoting the event and you get points for members that sign up with your referral id. The more points you have, the more prominent your gift will be displayed in the listings. But the most important fact is that all the contributors will be promoting and many have huge lists that will bring hundreds or even thousands of visitors. There are also lots of One Time Offers thrown into the mix and you can receive affiliate commissions on those and paid upgrades too. So look for a giveaway event in your niche or one that is a sidedoor niche and give it a try. But avoid the temptation to sign up for every event. You do need to promote the event to make this work and your list will get sick of you constantly promoting these events. Pick and choose. So how has it gone for me? Well, I’ve had 2 events in the online marketing niche and one in personal development that is still running. I’ve seen my list grow from 10 to over 60 subscribers. There are about 10 unconfirmed signups as well. I also had a couple signup and then unsubscribe after getting the download — a good reason to have links in your download so they may find you again. As my list grows I suspect I’ll be able to promote the events better and get a higher position for my offers (the rich get richer) as long as I don’t abuse the list by promoting too many events. If you’d like to know more about events then you can follow me on twitter at either LoneWolfMuskoka or MasterItCA and watch for my periodic promotion of these events. I usually promote twice for contributors and 2 or 3 times for the actual event. You can also search for “giveaway event” on Google to get some information about events that are coming up. The current giveaway in the personal development niche is Today is Your Day. It’s open until the 2nd of October, so there may be time to check out some of the gifts over there. Even if you’re late you can still sign up to get advance notice of the next one. I’ll try to put together more resources in a future post as well as updates on how things go with the latest event. There are over 2,000 members in this one and almost 400 gifts to choose from. If you’re interested check out the Massive Guru Event. It opens to the public on September 26 and runs until October 1, 2010. If you’d like to learn more about the product that I’m using for my giveaway gift you can check it out at http://masterit.ca/offers/TPOC/index.html (or you could check out the giveaways and try to find it 8=) The eBook is called The Power of Concentration and will help you learn to focus your mind on the tasks that you choose rather than being distracted and scattered. Here is an image from AWeber reports for the past month. You can see spikes in signups that correspond to the dates of the giveaway events. Click on the image to see it full size. 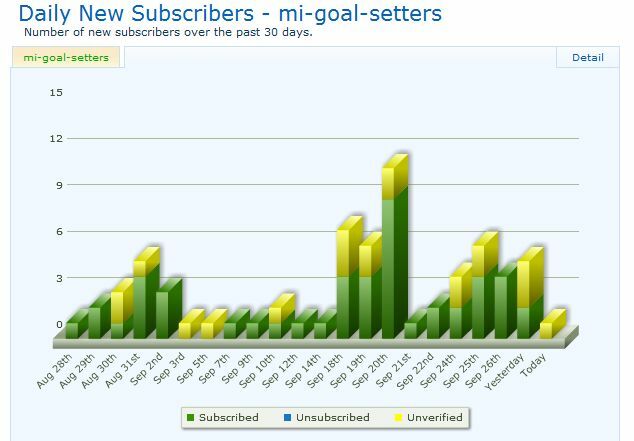 Note that I’ve erased the subscribers from my list who have unsubscribed, but there have been at least 5 during this past month, one of which was an older subscriber. But this gives you an idea of what kind of growth I’ve seen so far. So, in this month I’ve seen 49 new subscribers (I’m not sure if they count the unsubscribes in this total or not, but I don’t think so) and 21 unconfirmed signups. I’m also starting a new newsletter in a sub-niche so I did my first solo ad for my self. I had a confirmed signup to the new list in less than 10 minutes. Pretty cool! I’ve Discovered the Problem With Internet Marketing — It’s Me! Giveaways can be a great way to build your list quickly. Just be careful not to do too many of them or your list will get burnt out. Thanks for dropping by Nick. That is sage advice. I know that I get sick of hearing about these all the time. That’s why I only do 2 or 3 a month and I only promote them a couple of times on Twitter and at most 1 per week on my lists (well , list really at this point — I’ve only got one on the go right now but I’ve just started another that I’m beginning to work with). I think the giveaway promoters will encourage you to over promote which I wouldn’t advise unless you’ve got a list in a niche that is used to that kind of constant cross promotion. By the way Nick, for some reason Akismet caught you and I had to free your comment from the spam queue. It’s a good thing that you’ve got Gravatar as that stands out as non-spam, especially in the spam queue! What kind of return do you get on these giveaways? How many new signups do you get? It varies, but I don’t get as many as they promoters say you will 8=) They get thousands though, so maybe the secret is to host your own. I may take a crack at that sometime soon. I think if I had more people sign up under me I’d get a higher placement of my gift, but since I hardly have a list and I don’t want to spring for an upgrade it’s been dribs and drabs. But in the past month I’ve had my list go from 10 to about 60 with 3 different giveaways during that time — one lasted a week and one was for the whole month. The current one is in its second (and final) week. There is a bit of overlap with a 4th one that just got underway so I’ve seen 5 signups a day for the past 2 days. There is the odd unsubscribe after getting the download, but far less than I expected. Thanks for dropping by. I’m not too keen on you dropping an unrelated link in the comment like that though. I’ll check out fastbutter — I looks like another social bookmarking site, but make sure that you don’t do this kind of thing too often unless it relates to the post. You’ll start getting marked as spam. You get a link to that url in your “bio” section. No problem Deitel. Just don’t want you to get afoul of Akismet if other bloggers start hitting the spam button on ya. It is becoming a very sensitive issue lately. By the way, are you the builder of fastbutter or just a fan? It looks like an ambitious undertaking. Hi, LoneWold, I´m one of the FastButter team, and yes we have spend lot of time on the site, to make it as good as we can. The site is basically an answer of all complain on the new digg and ezine. We launched the site approx 1 month ago and we have reached lots of good feedback. We hope in the future to be a “facebook” for content rich material…but we have a long way to go. If you have any PR strategy feel free to pm me I will treasure it. And seriously your content are really good.